UCSC will dedicate the new Engineering 2 Building and the Jack Baskin Engineering Auditorium on Friday, November 5, in ceremonies that will include UC President Robert C. Dynes, State Senator Bruce McPherson, Assemblyman John Laird, and other distinguished guests. Engineering 2, completed in September, has added 150,000 square feet of new office, laboratory, and classroom space on the UCSC campus, primarily for the Baskin School of Engineering. The project also includes the 212-seat auditorium and a large open plaza that provides an inviting outdoor space between the Baskin Engineering Building and Engineering 2. The dedication ceremonies will begin at 3 p.m. In addition to Dynes and McPherson, speakers will include Acting Chancellor Martin M. Chemers, Engineering Dean Steve Kang, Interim Dean of Social Sciences Michael Hutchison, and UC Provost and former UCSC Chancellor M.R.C. Greenwood. "The Engineering 2 Building represents what UC Santa Cruz can achieve through partnerships with state government, with other UC campuses, and with private industry and individual donors," Chemers said. 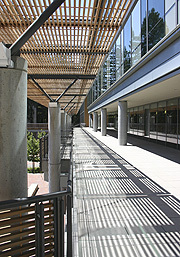 Engineering 2 includes facilities for two California Institutes for Science and Innovation: The Institute for Quantitative Biomedical Research (QB3) and the Center for Information Technology Research in the Interest of Society (CITRIS) are multicampus research centers supported by state funding and industry partnerships to provide the technological foundation for the state's future economic growth. Kang said the new building provides a much-needed expansion of facilities for the School of Engineering. "This is a major expansion of space that supports the further development of our research programs and provides adequate space for our staff organizations," Kang said. "In addition, the new space for QB3 and CITRIS will help these programs to flourish and achieve their goals." Darrell Long, professor of computer science and chair of the building committee that oversaw the project, will serve as master of ceremonies at the dedication. He noted that the building was completed ahead of schedule and under budget. Faculty who have moved into the new building are generally very happy with it, he said. "It's a beautiful building, and the open courtyard provides a natural gathering place that helps foster a sense of community for the engineering school," Long said. The Department of Economics has also moved into the new building, occupying about 75 percent of the fourth floor. The top floor of the five-story building will eventually be devoted entirely to QB3 and CITRIS. Regis Kelly, executive director of QB3, and James Demmel, chief scientist and associate director of CITRIS, will both take part in the dedication ceremonies. Also on hand for the dedication ceremonies will be Jack Baskin, retired engineer and philanthropist whose gifts to the campus include the $5 million gift that established the Baskin School of Engineering and, more recently, a $1 million gift that helped fund construction of the Baskin Engineering Auditorium.